Our Double-Sided Lunch Box Trolley has a large-capacity, suitable for more than one class lunch session. 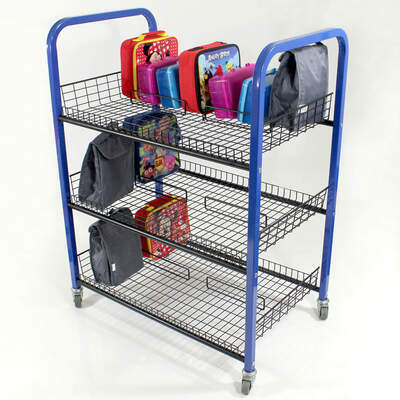 A strong welded steel frame features three shelf heights and provides storage space for up to 40 lunch boxes. For teachers, it allows lunches to be packed away during activities to prevent distraction. Four robust castors support large handles, meaning the trolley can be wheeled easily from classroom to dinner hall. And, the wipe-clean surface is easy to maintain while storing away with other school apparatus easily. During any lunch session, this lunch box trolley allows teachers to maintain control and ensures all food is kept elevated off the floor. Here at Gompels, we have a range of Catering Supplies to fit in with this double sided lunch box trolley. For outdoor picnics, our Gompels Super Tuff Side Plates are a durable choice while our selection of Napkins allow you to clean up quickly.